Greenleaf Book Group Press, 9781626342408, 264pp. If a message feels important enough for video, it's likely because you want to move the audience to action--potential investors to take a stake in your company, current employees to embrace a new initiative, prospective employees to bring their talents to your organization. Your video can help you inspire your tribe--the people you want to influence--to take action. But if you want them to do more than listen, your audience needs to feel an authentic connection with you. Veteran filmmaker Vern Oakley offers strategies that can help you relax and be their best, authentic self in front of the camera. The return on investment will be a stronger connection to those you want to reach; heightened respect, prestige, and interest in their organization; a stronger brand; and a longer-lasting legacy. 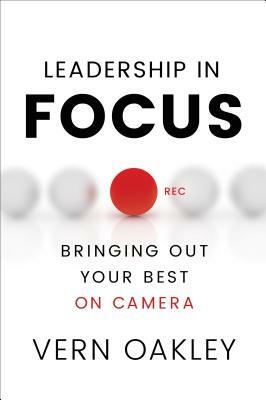 ​Leadership in Focus is a comprehensive, entertaining guide for leaders who realize that it's not just what you say on camera that's important--it's how you say it. Whether a CEO, middle manager, or budding entrepreneur making YouTube videos to influence their tribe, this book will help them rally others around a message. Veteran filmmaker, teacher, speaker, and industry thought leader Vern Oakley is CEO and creative director of Tribe Pictures, which he founded in 1986. Vern has created films for Fortune 500 companies, nonprofit organizations, universities, and their leaders. His mission is to help humanize the world's most successful leaders and institutions, helping them to craft their stories and connect to the people who matter most. Personally, Vern has been on a lifelong journey to explore and express his own authenticity and to create meaningful human connections. To this end, he has studied with a variety of experts and institutions from Arthur Penn and the Actor's Studio to Harvard Business School. A client of Vern's once bestowed on him the unofficial title "Business Artist." He believes this captures his comfort with both left- and right-brain endeavors and his passion for sharing these lessons with others.